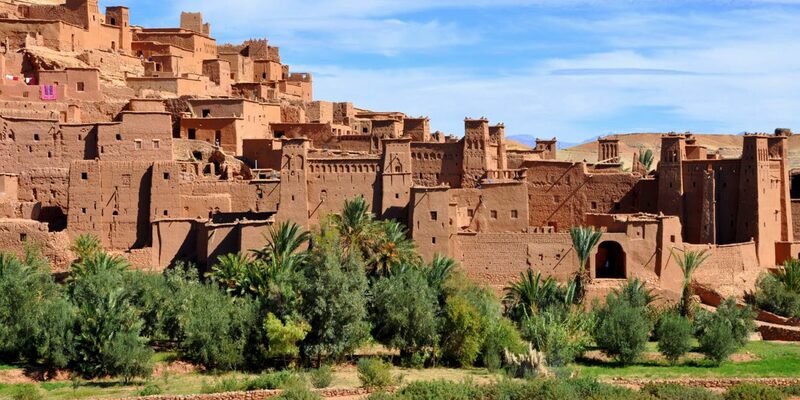 4 day Desert Tour to Fes : Cross the High Atlas Mountains to experience the timeless quality of traditional Moroccan life and the rich cultural heritage of the Berbers. South of the High Atlas, as the landscape grows barren and the sand becomes all-invading, seek out the oases of life – orchards, fields, palm groves and rose gardens that stretch out along strips of fertile land where the Berbers work miracles with a donkey and plough. Transfer from Marrakesh across the Tizi-n-Tichka Atlas pass to the traditional Berber village of Telouet for a guided tour of the Kasbah of el Glaoui, former War Lord and Pasha of Marrakech. Continue to Ait Benhaddou to visit the World Heritage Site of Ait Benhaddou, a spectacular fortified village (Ksar). After lunch in a local restaurant near the Kasbah, we will continue to the city of Ouarzazate. Option to visit the Atlas Studios in Ouarzazate and continue to Dades Gorge via Skoura oasis and stop to visit the old Kasbah ameridil in the middle of the palm grove and continue to Rose Valley (Kelaa Mgouna) where, in spring, Berber children line the route selling garlands of fragrant roses. Reach the gorges of Dades where you will spent the night in a hotel. After breakfast at your hotel we will leave to Merzouga via the Todra Gorge, the highest gorge in Morocco just 20m wide and over 200m high. Arrive at the edge of the dunes with the option to overnight in a hotel or go camel trekking in Erg Chebbi, with a desert guide, and sleep in a nomad tent at a desert camp where your guide serves dinner under the stars. Today is dedicated to visit the Merzouga wonders, we will start from the village of black people in khamlia originally from sudan, here we will enjoy a moments listening to their Gnawa music. After we will leave to Rissani th first city in southern morocco, we will visit the largest markets(souks). We will stop for a traditional berber lunch of Medfouna (berber pizza) then drive back to the hotel in the foot of the dunes. Wake early to see the rising sun and then ride your camel back to Merzouga. After breakfast depart for Fes via the Ziz Valley Gorge and cedar forests where Barbary apes live – this is an interesting route with a stop for lunch in a Berber café. Drop off at your accommodation in Fes.